The critical edition of the complete works of the theologian and philosopher of religion Ernst Troeltsch (1865-1923) is inaugurated by this edition of a classic text. 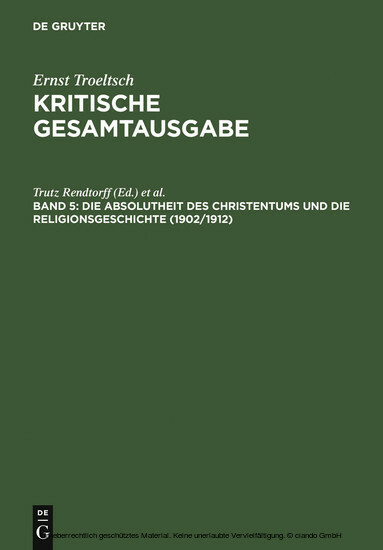 In the work 'Die Absolutheit des Christentums und die Religionsgeschichte' the theological and philosophical debate about the absolute validity of Christianity is joined with the question of value judgments in modernity, a question that has greatly agitated the cultural sciences since the beginning of the twentieth century. The work on absoluteness, the first and second editions of which are published here for the first time together with handwritten additions by Ernst Troeltsch, gives significant testimony to a constructive historicism that is aimed at establishing universally valid norms in the cultural comparison of religions, while acknowledging the individual forms of historical life. At the end of the twentieth century, the posing of the problem as developed by Troeltsch is of new global relevance in the debates of theology, the study of religion, history, and sociology.